Staun Deflators – Are they worth it? 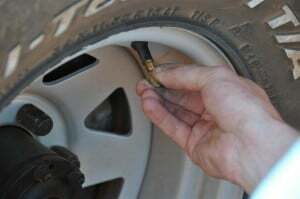 One of the most important things to remember when going four wheel driving is the tyre pressures that you are running. For gravel, you need to reduce your pressures a from bitumen driving pressures. Mud, rock and sand driving require the pressures to be even lower. In order to let your tyres down quickly, there are a number of tyre deflators on the market. One of the most popular ones however, is a set of Staun Deflators. Staun Deflators are brass fittings which screw onto the tyre valve, and compress the valve stem a certain amount, letting air out to a pre set pressure. How do you use Staun Deflators? To use them, you simply remove the valve cap and screw one on. It will let the tyre pressure down to whatever you have them preset at. In this way, you don’t even have to touch a tyre pressure gauge! Do you still use a rock to deflate your tyres? Some tyre deflators unscrew the valve stems and as a result allow a considerable amount of extra air flow. The Stauns don’t do this, but then you have the advantage of all 4 working at the same time (one on each tyre). From my experience, Staun Deflators take about the same time as an ARB one when you are deflating all 4 tyres. The difference though, is that you kneel down next to the ARB ones, and you have to check the pressures from time to time. The Stauns are much simpler to use! With the Staun Deflators, all you do is screw them on and then you can relax, and get some food out. They will deflate to the pre set pressure, and then you can remove them, put the caps back on and be on your way! When you purchase Staun Deflators, they come with a preset pressure (usually 18 PSI). If you want to reset this, you can turn a part of the fitting and the amount of air it lets out will vary (in between 6 PSI and 30 PSI). Some people carry a few sets, for different driving. 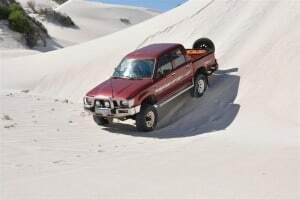 For example, you might have a set to let your tyres down to 25 PSI for driving on corrugated gravel, and another set to let the tyres down to 16 PSI for driving on the beach. Can you drive with them left on? I have seen people leave the Staun deflators on while four wheel driving, but I don’t recommend it. They will get full of dirt, and they could let your tyres down while you are driving along! I have heard a few people complaining that the Staun Deflators will adjust themselves over time, especially if you have them rattling around in your centre console. I would suggest if you keep them in their pouch there should be no issues. The only other real disadvantage of these is the fact that they will only do one tyre pressure, and you can’t very easily adjust them quickly to let different amounts of air out. Let the Stauns help you get here faster! I still use a Ferret Deflator, but I will purchase a set of Staun Deflators soon. They are simple and easy to use. If you don’t require a lot of different pressures (for example if you only drive on the beach) they are perfect. If you find yourself regularly changing tyre pressures, the ARB Deflator is a good alternative. You could always get two sets of Stauns though, and have the best of both worlds! You can easily get these for around $70, but if you want a better price you either have to look on eBay, or wait until a sale comes on at a store that sells them. Please be aware of any ads that say ‘Staun Style Deflators’ as these are replica’s and I cannot guarantee their quality! We have a pair of these and they are CRAP! It is worth the time to take the air out each tyre individually and have the same pressure all round. If you ask me they are a waste of money. We bought a ARB tyre deflator. It takes about 10 mins longer but well worth it. When your off the beaten track then why not relax and enjoy yourself, really how much time do you actually save by rushing? Most people rush about trying to get things done as quickley as possible and end up stuck on the side of the road or in a bog because they didn’t take the time of care to do things properly in the first place. As the saying goes slow and steady wins the race and gets to see a whole lot more along the way by not rushing! What don’t you like about them? I personally prefer the ARB deflator, or a Ferret one. I believe Staun is no longer trading, so the supply of their deflators must be almost gone. I don’t have a problem enjoying the surroundings, but I find my knees and back tend to get sore after deflating 4 big tyres! They are just too inconsistant. I understand about you back hubby is the same, that’s why we thought we’d try them. anything that makes life easier is worth a go! We gave them ago and found you set the correct pressure tighten them and when you go to use them the pressure is different in each tyre. Hubby is really into his 4wding and has come to realise tyre pressure is just as important as driving skills when 4wding. At low pressure it makes a huge difference in handling and vechile control. I have heard of them adjusting pressures by themselves, which would be a pain. I read a while ago that you can Loctite them at a set pressure – that way you are guaranteed they won’t move. Still, like you say tyre pressures are very important and there are other options! I have used these without problem. If you are concerned about each of the tyres being at different pressures you could still easily enough fine tune the pressures once the deflators had done most of the work. I don’t think using these means you are rushing as you can still take your time if you wanted to! Do they still make the stauns, or is it all just the copies? I’ve been using the ARB EZ deflator now for a long time, and am much happier with it. Tyre pressures are critical; I wouldn’t be happy with deflating to a pressure that may or may not be correct. That said, they have an application for those who do the same 4WDing day in and day out.